that's random | Anne Z. that's random – Anne Z. Posted on April 1, 2012 April 2, 2012 by Anne Z. This is something I’ve been wanting to address, because I care about encouraging women to enter and succeed in STEM fields, because I am/have been a programmer, and because there’s a lot of angst around this. No, the discussion is not specifically about whether women should learn to program, but it is especially pointed and sometimes painful for women. Girls are not usually encouraged towards STEM careers and even less towards straight computer science. When women do make it into STEM fields, they may find themselves marginalized or otherwise stressed by the overwhelming dominance of men in technology. On one hand, I think the answer is easy: if you need to know how to program to progress in your career and achieve your goals, then just do it. I went back to school after completing a bachelor’s degree in economics and philosophy so that I could gain programming skills. I did an M.S. in statistics but spent all my electives in the computer science department, because I knew that if (in the early nineties in Silicon Valley) I could demonstrate programming skills, I would be welcomed into the job market. And I was. 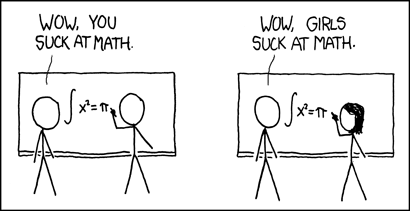 Then I found many years later, that statistics + programming + domain knowledge = data science = $$$. Score! Math (… computer programming … physics … etc) is damn hard. If you don’t have the brain for math (… computer programming … etc), don’t bother. It’s too damn hard! Girls don’t have the brain for math (… computer programming … etc). Our culture thinks that natural aptitude matters more than hard work in figuring out subjects like math and programming. This is not the case in other countries; in Asian countries it is thought that academic achievement including in math and science is primarily due to hard work. It is the performance mindset in action rather than the growth mindset, which says that hard work is almost everything. There’s just a short step from the performance mindset that dominates in the U.S. to thinking that certain groups have natural advantages in learning such subjects and that certain groups have natural disadvantages. That sort of bothers me, because I know in some ways I come across as not a representative case for women’s capabilities at large. I am, however, a representative case of why more women don’t study computer science in college. Despite having taught myself BASIC on my dad’s Apple IIe in middle school, I refused to take Intro Computer Science as one of my distribution requirements in college after hearing from (female) friends that the class was killer. I didn’t believe I could hack it. I came back and took it in my master’s program. To my shock, it was not only easy, it was fun. I got an A+. If I consider where we need to aim, I’m thinking it’s not at the idea of whether girls are good at math/programming/etc or not but rather from this idea of whether such subjects require natural facility or not. They do not. They require a lot of hard work, for everyone, no matter their gender or their race or their obvious natural facility for things technical. I do not want to dismiss the very real social challenges women meet in male-dominated environments. I cannot speak much to that as I’ve never felt unwelcome or harassed among male-dominated teams. Quite the opposite: I find working with men exciting. So ladies/women/girls, dive in. The water’s cold and the current is strong: you’ll get a good workout. Enjoy! Posted on February 25, 2012 April 4, 2012 by Anne Z. Trying to find yourself is a staple of the self-help literature, along with the striving for authenticity and building up your self-esteem. I probably wrote about authenticity and how you needed to practice it in my book** because way back in 2007, I thought it was a good thing, a necessary thing. Now I’m convinced that’s all wrong. The self that matters isn’t some tightly defined, self-loving, individuated thing in the world. The self that matters is the mashed-up self, the networked self — the self made up of relationships and experiences and interactions and ideas. It’s way bigger and more powerful than the un-networked you. These are some ideas I want to explore: combinatorial creativity, connectivist learning, the third person perspective in the creative process, and self-transcendence. What all these have in common is they all overturn the idea that the individuated self is primary. Which is interesting, recognizing not only the absolute value of content but also its relational value, the value not just of information itself but also of information architecture, not just of content but also of content curation…. This relates to how we conceive of ourselves. Are we distinct individuals with hard boundaries? Or are we somehow only ourselves when you consider how we fit into a network of experiences, people, and knowledge? Don’t try to define yourself, instead, suspend the question. That gives you a better lens by which to create anything you want to be. Questions of identity got in the way of the creative process, even when people thought well about themselves. It took years to come to understand this. Everything pointed to a fairly simple and, yet, revolutionary pair of insights. The first was that what people thought about themselves, good, bad, or indifferent, wasn’t going to change. All notions of self-esteem training are predicated on the idea that people can change how they see themselves. This is one reason they don’t work. The other insight was just as major. It is that your view of yourself has no place in the creative process. Simply put, the moment you make your success or failure about you, that’s the moment you can’t learn what you need to learn, experience what comes with the creative territory, and keep your focus where it needs to be, on the outcome you are working to create, and where you currently are in the creative process. In his books, Fritz suggests that creators need to use a third-person perspective that takes themselves out of the equation rather than the first-person which makes creation all about the self, the I, the creator herself. Creation doesn’t grow out of some authentic, independent self. It launches from a networked self which is almost like no self at all. Maybe the reason that thinking too much about our identities as distinct individuals stops us from creating is because creation comes through mashing up, through navigating networks of people and knowledge and ideas, not from the perspective of one isolated node in the network. The node alone is useless. So we need to stop thinking so much about our individual selves — we need to transcend ourselves. Interesting that some of the most satisfied people combine a love of the new with persistence and self-transcendence. These seem like exactly the traits you’d need to succeed in a networked world. Neophilia (novelty-seeking, love of the new) draws you to new ideas, new people, and new experiences, giving you more material for the mashup that is you and the mashups you create. Persistence keeps you from being merely a dilettante, flitting from one new thing to another. And self-transcendence stops you from thinking that it’s all about you. It’s really freeing to realize your self alone is this puny, incompetent thing whose self-love or self-loathing matters not a bit. It’s your networked mashup self that matters, that’s capable of doing and creating great things. * With credit to JP Rangaswami for his “musing lazily about” series. I like to be able to wander around a topic without reaching any conclusions or forcing it into some structure that might obscure the evolving ideas. ** Which shall remain unnamed and unlinked because I’m so beyond what I wrote then even though I feel like there were some really great ideas that I’d like to expand upon and refine. E.g., busy vs. bursty. Posted on August 14, 2011 August 14, 2011 by Anne Z. But big ideas have always rested on some sort of social connection across people and they haven’t always required the written word. Big ideas don’t issue forth from the head of one really smart person, working alone, reading, reading, reading then Eureka! No, they arise from the synthesis of multiple ideas and practical knowledge that together are greater than the sum of their parts. What’s required for this? That people be in some sort of social connection with each other. Last weekend, we visited Mesa Verde, an archeological site and national park that shows how the Ancestral Puebloans lived in the time period from roughly 550 to 1300 A.D. While the cliff dwellings themselves inspired awe (and sometimes required special tickets and patience to tour), it was more interesting to me to see the progression of architecture at sites along the Mesa Top Loop Road. Here’s where you could see the Puebloans build towards the big idea of cliff dwellings. From 550 to 750 A.D., they mostly lived in pithouses on top of mesas but sometimes in cliff alcoves, then progressed to adobe houses clustered into villages. By 1000 A.D. they had developed stone masonry techniques for constructing buildings two or three stories high with 50 or more rooms. It was about 1200 A.D. that they moved their buildings into cliff alcoves, a spectacular form of architecture with practical and aesthetic benefits. Who came up with the big idea to build a multi-story stone dwelling in the shaded and protected alcove of a rocky cliff? It certainly wasn’t one person acting in isolation and doing a lot of reading and writing. This big idea did not rest upon the written word and lots of deep thought but rather on social knowledge and practice of stone masonry construction and on ideas and experience about where the best place to live was (mesa top or cliff alcove?). If the Ancestral Puebloans did have Twitter, I could imagine them using it share tips about how best to construct a beautiful and sturdy multi-story dwelling, sited for protection and convenience. Most big ideas rest upon a wealth of little bits of knowledge that don’t need to be written up as a journal article or book. How we connect differs depending on where the people we want to connect with are. In the 17th and 18th centuries, French intellectuals gathered in salons. In the 20th century in the U.S. and other western countries, connecting through higher education channels and journal articles and at government-funded research centers was a good bet. Now, some people connect online using tools like Twitter and Facebook and Google+. This doesn’t necessarily replace long-form writing but it does complement it — making the generation of big ideas more, not less, likely. Posted on September 8, 2010 September 8, 2010 by Anne Z.